Guess who’s 18 weeks pregnant? This girl! This past week was packed with work, meal prep, and my third midwife appointment. Work has been good, albeit busy. I am definitely counting down the weeks until the semester is over, and I will be done teaching my college classes. I am ready for a bit more rest in my week, and balancing two jobs has been a lot tougher this semester because of the pregnancy then it was last semester. I am dreaming of the day when I only have one job! I can finally stomach cooking raw meat again, and that has made home life a lot better as I’ve eased my way back into meal planning, meal prep, and cooking! My third midwife appointment went great–I heard baby’s heartbeat for the second time, talked over some concerns with the midwife, and left the appointment in great spirits. In the next week or two, I need to send in my pre-registration paperwork for the hospital I am planning on giving birth in. I can’t wrap my mind around this! 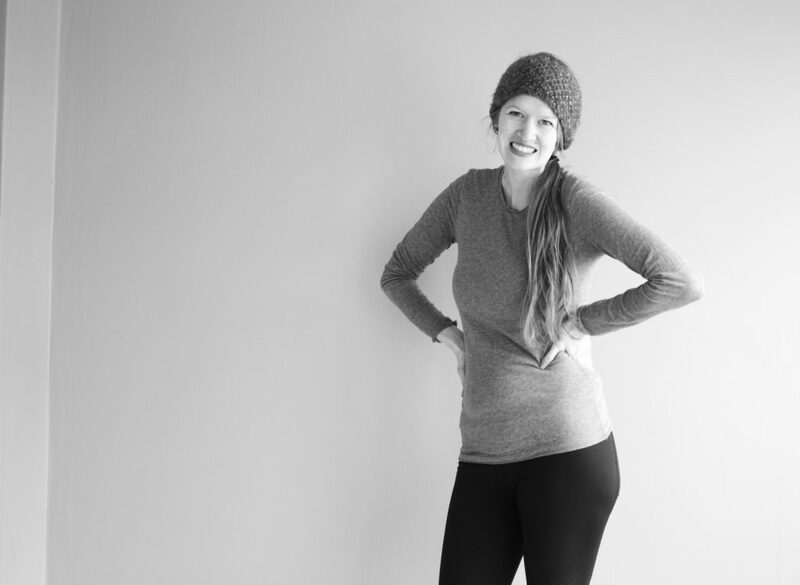 Back at my first prenatal appointment, she gave me the paperwork and told me to send it in when I hit twenty weeks along–which seemed like an eternity at the time, but here I am about a week and a half away from being half way through this pregnancy. Say, what?! Gender: Not sure. 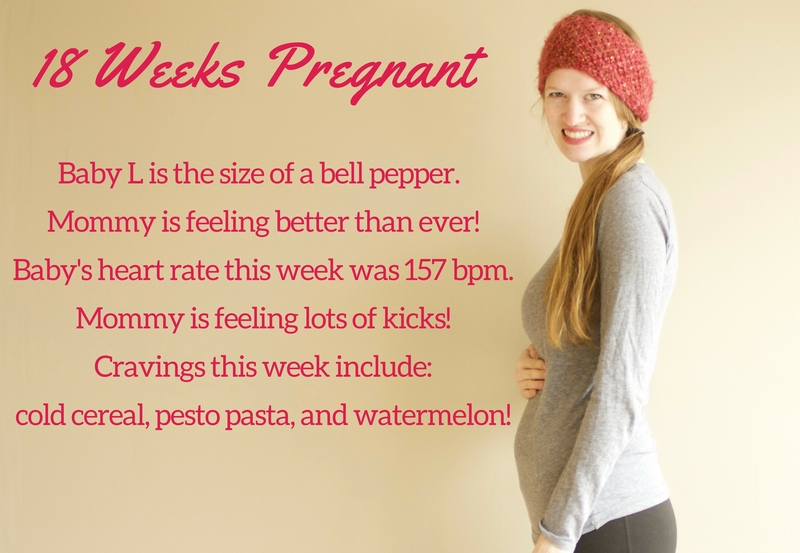 At my midwife appointment this week, baby’s heartbeat was 157 (which is even higher than last time), and in a healthy range. The old wives’ tale would say that baby was a girl, so I guess we’ll see! I chatted with my midwife about the heartbeat, and she said that as baby’s nervous system gets more established that his/her heart rate will probably go down as the pregnancy progresses. She said that for the old wives’ tale to be proven correct that they would have to do a huge study where they compared heart rates of tons of baby’s at the same stage (not comparing a 13-week heartbeat with a 32-week heartbeat). She laughed about it with me. Weight gain: I’ve been so worried about not gaining weight, that I even took this off of my bumpdate the last few weeks. 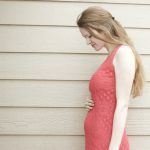 I am getting so close to the middle of my pregnancy, and I felt like I should’ve gained something by now? 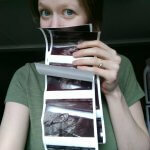 I talked to my sweet Labor and Delivery Nurse friend who is my go-to source of pregnancy knowledge (thanks Catie!) and she assured me that I had nothing to worry about. I also brought it up at my midwife appointment, and she said that at my second appointment I’d lost four pounds (due, in a big way, to the fact that I was sick for so long with a virus) but that at my third appointment I’d gained four pounds. So while I am still at my starting weight, I have technically gained four pounds in a month. Which she’s happy with. So, I left that appointment beaming. I gained four pounds in a month guys, yay me! I even bought a milkshake on my way home, because why not? Purchases I’ve made: Not sure if this is pregnancy related, but I purchased a new mop. My kitchen floor has really been bugging me, and I’ve felt a bit of an urge to spring clean. We’ve only ever had cheap-o wet mops that never get the job done. While I’ve drooled over the Norwex mop, I didn’t want to shell out $130 for a mop. So, I did a bit of research, and found some similar mops on Amazon, with a ton of great reviews. I love the style of mop that has a mop pad that you can just wash, so you don’t have to buy wet cloths all the time. I decided on ordering this one, and I can’t wait to get it! How are you feeling? Every day is different! Overall, I am feeling the best I’ve felt this whole pregnancy! I am getting my energy back, I can cook meat again (huzzah! ), and I don’t feel constantly exhausted. I still tend to puke once a week (this week, it was because I had the audacity to take a shower in the morning before I ate something, but puking in the shower is one of the nicest places I have had to do it, so there’s that). I’ve also been struggling a lot with headaches/neck pain which has crippled me a bit this week. My midwife said it is really normal at this point in pregnancy, and that it will eventually go away and be replaced by a new symptom. So that’s…encouraging? Ha ha! How big is baby? Baby is 5 1/2 inches long, and about 7 ounces. About as big as a bell pepper! This week, baby: Baby is busy flexing his arms and legs, his ears are now in their final position, baby can now yawn and hiccup! Maternity clothes: Still just wearing all my regular clothes, although I tend to favor the jeans that ride lower (so they don’t press on my belly) and shirts with a bit of room (which, luckily, is almost all my tops). Sleep: Sleep is still good, overall. Struggled a few times this week due to headaches/neck pain. I am just trying to get adjusted regularly, get my bi-monthly massages, and embrace the warm dish cloth. I think I might have to invest in a heating pad since it seems like this headache thing isn’t going away. Best moment this week: a few patients at work (I work in a chiropractic office) found out that I am pregnant, and they’ve chatted with me about their favorite memories with their kids. There are so many people that tell me about how tough it is going to be, that I really treasure those who just say, with tears in their eyes: “having my son was the best thing that ever happened to me. Holding your newborn for the first time is just so…incredible”. It just makes me even more excited! No one knows I am pregnant except those that we’ve told. I still look just a bit thicker around the middle, and that’s it. It may be awhile before strangers can actually tell that I’m pregnant. Worst moment this week: Puking in the shower, and times when I was so hungry, but felt like if I ate the wrong thing I would start throwing up. Miss anything? Being able to wash dishes without gagging. Ha ha! Cravings: watermelon–all day, every day. Fried or scrambled eggs. Chocolate milk (it always settles my stomach, it is like a miracle). Berries. Protein shakes (for meals that I don’t feel like food), pesto pasta (made from basil I froze from our garden), and cold cereal! 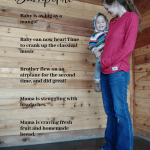 Symptoms: headaches, neck aches, round ligament pain, gagging when I wash dishes/brush my teeth/smell a smell, nausea if my stomach is empty, constant need to use the bathroom (I think baby is bouncing on my bladder, like it’s a trampoline). How’s Daddy doing? Saia, my hubby, has been a rock through all of this. At any given time I have been known to melt into a pile after working, whimpering about how hungry/nauseous/headachy I feel. He scoops me up, places me on the sofa, whips up a meal, and lifts my spirits. I really don’t know how I would’ve survived this pregnancy without him. He has been the best through it all, and I am so grateful that I met and married such a great guy! Looking forward to: our first ultrasound! 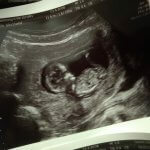 I was supposed to have it at twenty weeks, but my next appointment falls on week 22. So, my midwife told me I could come back in two weeks for my ultrasound, and then come back two weeks later for my appointment, but since I have to drive over an hour to get to my midwife’s office, and take off time from work, I decided to just wait for the 22 week appointment. Which kills me a little, since I know I could see baby in a week and a half if I would’ve opted for going in twice. Sniff. But it will come soon enough, right? p.s. You are so cute. 🙂 One of these days there will be no question about your being pregnant! And, the fact that it’s hard to tell that you are pregnant will be totally balanced, during your second pregnancy, by the fact that you will have to change jean sizes up, on Day 2 of your pregnancy. 🙂 🙂 🙂 It happens. Amy Young Miller recently posted…Infinity Jars: Raising the Bar on Glass Jars, and a giveaway! Ha ha! This is what I’ve heard. Guess I should enjoy the small belly while I have it.